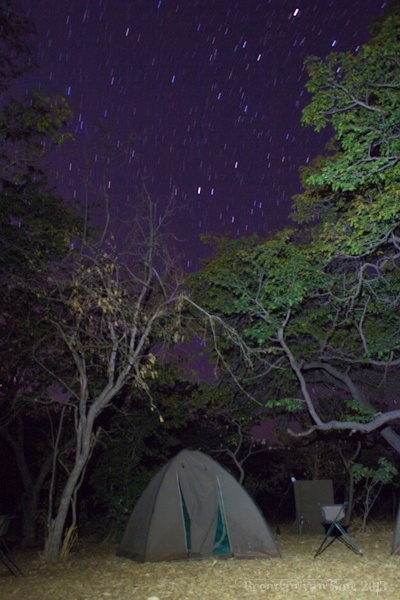 With a full moon rolling through the sky, I zip my safari tent shut while leaving the screen open enough to watch the light show of a night in Chobe National Park. The stars pierce the early night sky before the full near-full moon chases them into hiding and me into a sleep. Curled up into a ball, my slumber is anything but pure. The grunting warning of a male impala interrupts my sleep first. It sounds like a warthog being attacked rather than a graceful antelope. Later, the sound of hippos in the distance bounces through the night sky like a chorus of laughing cows. Finally, the hum of my alarm clock stings the air. It’s time for work. 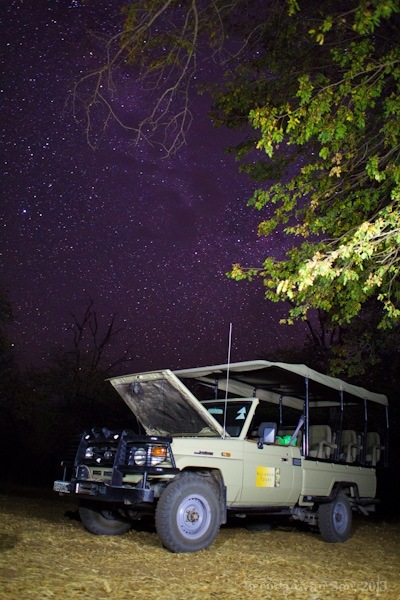 I’m on safari in Chobe National Park with Kalahari Tours, and tonight I’ve decided to wander out into the night to capture the stars hanging up in the clean Botswana sky. 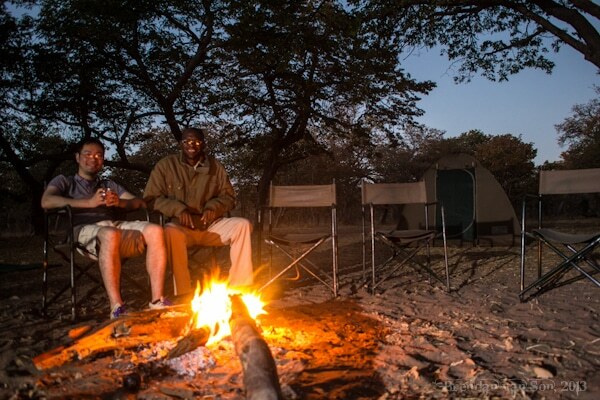 Our campsite is plopped down directly in the middle of Chobe National Park. There are no fences protecting us from nature. There are no street lights. Only the illuminated sky can guide me, and protect me. I step out under the stars and awkwardly stumble my way across the dirt floor which is strewn with the fall’s leafs looking for a scene worthy of a photo. I sit down on the dusty surface and set my tripod between my feet. 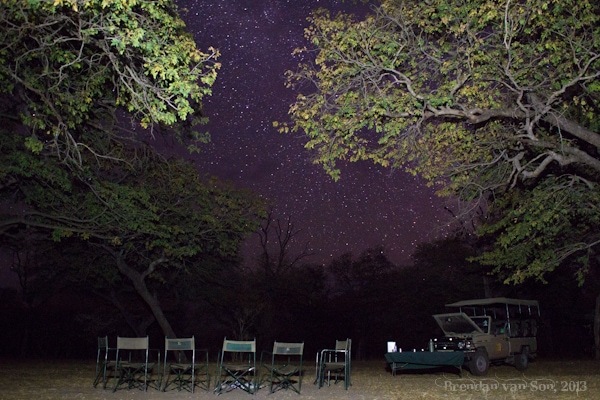 After a couple test shots, I’m ready to pull the trigger on some star photography in Chobe National Park. Just as I set my camera to take a 3 minute exposure, the forest seems to come alive with activity. Instinct tells me to run and hide in my tent but unfortunately, I’ve forgotten my wireless trigger in Livingstone, and for a long exposure I have to hold the shutter with my index finger. In the distance to my left I hear hippos calling and nibbling wandering through the forest. Hippos kill more people in Africa than any other animal. Behind me I can hear the rumbling of antelope. But it is a muffled grunt that sends my heart rate way up. The distinctive coughing call of a male lion floats through the air and attacks my senses. I try to tell myself that the call could be as far as a kilometer away, but I know that it’s much nearer, maybe a hundred meters or two. I look back at the hole I’ve left in my tent in case I have to make a quick escape. I consider running, but only a minute has expired on my camera’s exposure. I’m going to wait to see if the sound gets a little bit closer. Another minute passes on my exposure and I start to hear a shuffling of brush just on the other side of one of the tents. The lion? I stand as far as I can towards my tent while maintaining my index finger’s pressure on the camera’s shutter. I keep one eye on the hole in my shelter and the other on the area where the sound is coming from. It shuffles closer and closer, and I realize I’m at the point that running would only entice the animal. I decide that shining the flash light on my phone towards it is my only option. It’s still behind the tent but moving closer, and the sound of sniffling starts to dance towards my ears. With the light shone directly on the path of my would-be attacker, the beast enters my eye sight: a honey badger. My nerves calm for a second and I empty the deep breath I’d been holding tightly in my lungs. Then, I remember hearing stories of people being attacked by this vicious animal. I shake my light in hopes of startling the little badger which is famed as one of the most fierce animals in Africa. The honey badger doesn’t flinch. Instead it starts towards me. I hear my camera click. The photo is done. I lift the camera up by the tripod, intent on using the legs of the tripod as a weapon if I have to. Then suddenly, the badger stops, lifts its nose towards me turns to the right and races off at top speed. Exhausted, I fall back into a seated position. The guide opens his tent, walks out into the now dusk light and offers me a cup of coffee. “Anything exciting?” He asks as he points to my camera. 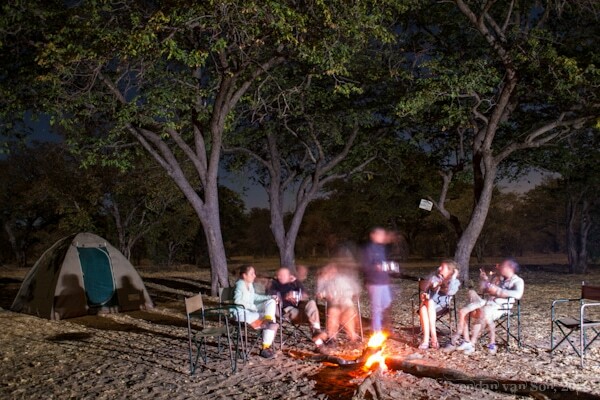 No big deal, just another night in the wild of Chobe National Park. Just another early morning in the unforgiving wild of Southern Africa. Anything exciting? Indeed, it was! Many people have the wrong idea about the sweetly-named honey badger. They think cute and cuddly, when really it’s all long claws and sharp teeth, strong enough and determined enough to kill a three-metre python or give a leopard a serious run for its money. Believe me, this is not a creature to tangle with so I’m glad you lived to tell the tale! Jeepers that’s some white knuckle photography! Glad you survived the night!